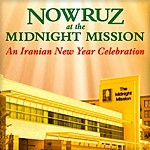 The Midnight Mission (TMM) proudly announces its second annual Nowruz event — a special street celebration that will honor life and revive and renew the spirit during the start of spring. Steeped in history, Nowruz is an annual celebration that marks the beginning of the Iranian New Year for people of all faiths. It is also a time of deep spirituality when light symbolically conquers darkness, and people open their hearts to help those less fortunate than themselves step into the light. In honor of this 3,000 year-old holiday, the Iranian-American community—led by TMM’S Nowruz Organizing Committee—is coming together to give back to more than 3,000 Skid Row residents with a street celebration. The colorful outdoor festival will feature a traditional Nowruz meal and delicacies as well as live entertainment and special performances by dance ensembles. In keeping with the Nowruz tradition of gift giving for the family at New Year, a selection of clothing and toys will be donated to each person in attendance. To get involved and learn more, please contact Mark Farber, Director of Major Gifts at 213.553.2329 or visit www.nowruzinla.kintera.org.